When I rediscovered rocketry (after a 20-year absence), I found a much-expanded hobby with much larger, more exciting and more dangerous rockets for bigger boys. I guess that makes me a Born Again Rocketeer (B.A.R.). Rocketry has been my primary hobby since 1998 and I've done a lot of it since that time. From starting out as a newbie at LUNAR and ROC launches through being the Prefect of AERO-PAC, I've learned a lot, met a bunch of great people and had wonderful fun. This site started out in 1998 as a list of pictures of my rockets, and those are still here in the "fleet" section. However, it's also become a repository for articles on technique and research I've conducted which make up the "how-to" section. My most recently completed rocket is the scratchbuilt Boosted Arcas. 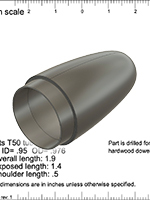 The most recent how-to page is a video on making a 3D printed nose cone. A video on the three most import HPR techniques. A how-to video 3D printing large parts in multiple pieces. The 2-stage Boosted Arcas completed for launching at Aeronaut 2018. 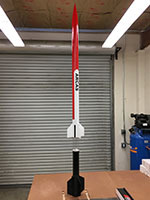 Finally launched the Madcow AGM-33 Pike and MAC Performance Sky Scraper 4". See the Updates page for a complete list of recent changes, plus some highlights from the long history of this site. I try to keep this site current, fully working and attractive. Please let me know if you find broken links, errors or even typos.